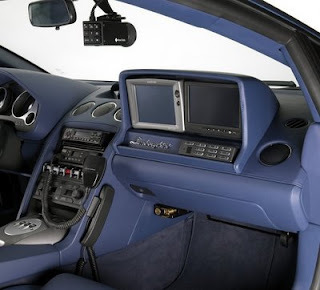 Italian Police Get New Lamborghini Gallardo LP560 "Polizia"
Speeders will have a hard time out running cops in Lazio, Italy after Italian super car maker Lamborghini handed Antonio Manganelli, head of the Italian State Police, the keys to a Gallardo LP560 "Polizia" model. Here in California its not unusual to see the occasion Mustang or Camaro Highway patrol. But I have to say the Gallrado LP560 puts them to shame. This has to be one of the coolest cop cars I've seen! The all-wheel-drive Gallardo LP560-4 boasts a 5.2-liter V10 that makes 552 horsepower and 398 foot pounds of tourque. The car has a 0-60 mph time of 3.7 seconds and reaches a top speed of 203 mph. Sant’Agata Bolognese, October 24, 2008 – a private ceremony was held today at the Viminale Palace where Automobili Lamborghini S.p.A. donated a police version of the company’s newest super sports car, Gallardo LP560-4 Polizia, to the head of the Italian State Police, Prefect Antonio Manganelli. 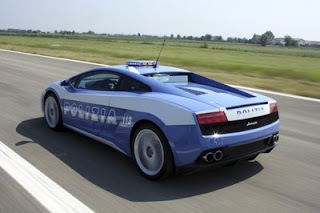 The new Gallardo LP560-4 Polizia, which replaces the previous Gallardo in use by the Italian police force since 2004, has a 560 horsepower engine that can reach speeds of up to 203 mph. 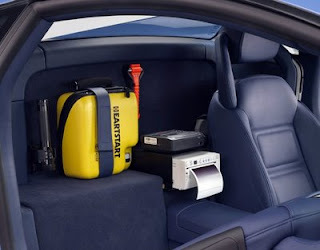 The car will begin service with the Lazio Highway Police Department in order to continue accident and crime prevention to sustain security on the Italian roads.